When we moved to Central Europe to begin the ministry of Josiah Venture in November, 1993, there were just two couples in our first months of life here: Dave and I, and Dan and Laura Hash. We moved to Czech, they moved to Poland. Shortly after our moves, Laura and I learned we were both expecting. In October of '94, our Claire arrived at the beginning of the month, and their Jacob arrived at the end of the month. The day he was born, I was at the Polish hospital to see him (albeit through glass as they didn't allow visitors to be up close to the babies back then!). From then on, I watched Jacob grow up firsthand. We had him at our house many a time over the next 18 years, vacationed with he and his family, and later celebrated his and Claire's graduations together before they headed to college, among the many other things we did with he and his family through the years. 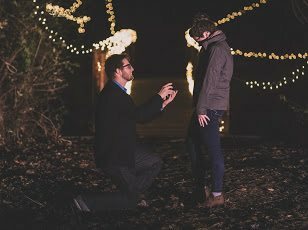 Jacob proposed to his darling Becca on Saturday night in Siloam Springs, Arkansas where he is a senior at John Brown University!!! She came out to Poland as an intern with JV, meeting Jacob there a few years ago. 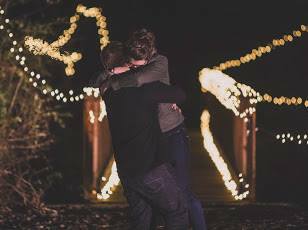 And now, they are engaged!! I'm thrilled for them, happy as any adoptive "aunt" would be! It is ever so sweet to watch our older JV Kids move into their adult years with such strength and maturity, walking with God and taking bold steps of faith to follow Him. Well done Jacob! I'm excited for the life God has in store for you and Becca as you serve Him together! I hadn't heard about Jacob and Becca's engagement. So happy for them!!! YAY!!! Oh Connie! Thanks for sharing this and rejoicing deeply with us! !